RUTHIE WAS ONE OF MANY COURAGEOUS U.S.A. WOMEN. Not long after Nazi dictator Adolph Hitler’s attempt to conquer the world, obliterate Judaism, slaughter millions of Jews, invade Poland, Czechoslovakia, occupy Austria, bomb the hell out of Britain using der Furor’s powerful Luftwaffe air force, the Japanese launched its December 7, 1941 sneak attack on Pearl Harbor in the Hawaiian island of Oahu. Not only did that devastating attack on Pearl get the U.S. into World War II, it revealed a dormant spirit within the men and women of our nation. It was a wake-up call that made us realize that now was the time for all good people to come to the aid of their country. It was a time for great sacrifice, a time to fight an enemy that’s threatening the freedom of what we continue to call the land of the free and the home of the brave. And for those reasons, I’d like you to meet Ruth Channon who was one thousands of American women to change their lifestyles by giving up their comfortable world as housewives, moms, administrators and clerks to support their nation which must go to war against a well-trained, goose-stepping enemy known as the Axis. At that moment in history, hundreds of thousands of men left the workplace and joined the U.S. armed forces. At the same time, millions of women from all walks of life and levels of society, forfeited personal and professional comforts to take over the jobs men vacated. So Ruth Channon, an ambitious young woman, gave up her dreams to become what she whimsically and proudly calls herself, “Ruthie the Riveter.” What makes Ruthie unique is her positive attitude,her sense of being a woman, and the fact that the mother of my late childhood friend, Bumbo, turns 100 years old on Wednesday (April 1, 2015). 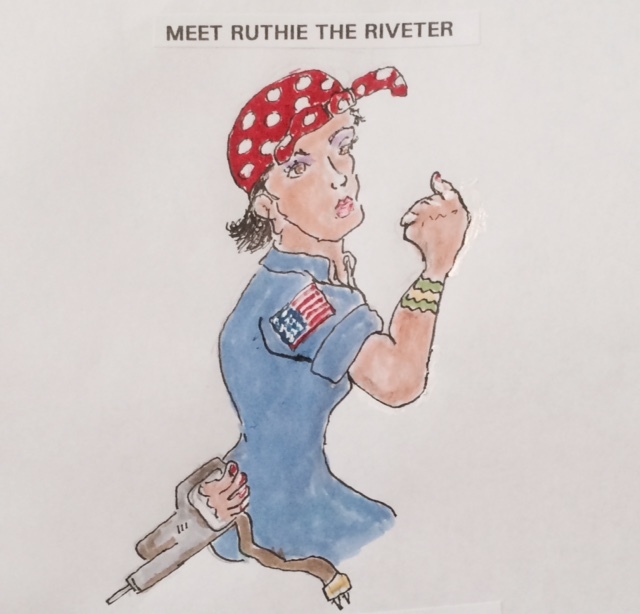 For at least two years, Ruthie worked as a riveter at Hughes Aircraft Co. in Culver City, Calif. During the war, her mother would baby-sit with Bumbo and his sister Sheila while Ruth riveted away helping build fighter planes and bombers to battle a powerful enemy that would make Darth Vader look like a kindergartener. When I asked Ruthie if by chance she worked on a bomber that actor Clark Gable served on as a tail gunner, she had no idea. As the story went, when German field marshal Hermann Goering learned at Gable, a well-known motion picture star, had enlisted in the American Air Corps and was a tail gunner, the notorious field marshal had offered $5,000 to kill him. When I asked Ruthie about her going to work, leaving her two young children at home, she explained that as a single parent, her mother would baby sit with her young son, my childhood pal Bumbo, and her daughter, Sheila. For a long time after his return to civilian life, he remained traumatized like the combat infantrymen who return from the Middle East today. Ruthie told me, a thump in the night would send the former sergeant diving under the bed. Even action scenes in a movie, like “Return to Bataan” would cause Saul to hit the deck in a movie theatre, taking cover behind rows of seats. To get the trembling ex-GI back onto his seat, Ruthie said she would have to remind him that it was only a movie they were watching in a darkened theatre. Happy birthday, Ruth Channon. Happy one hundred years of adventures in this troubled world. Another great life story, nice going, Boots. Best.